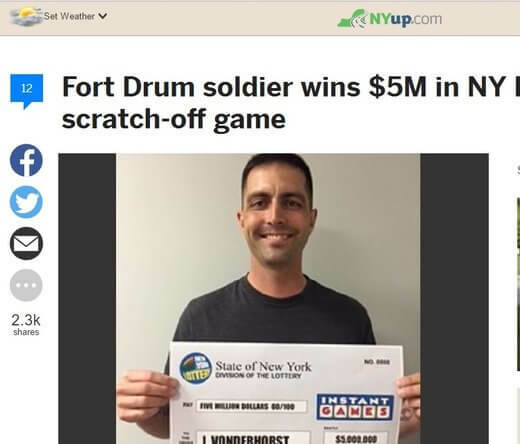 The biggest victory of a soldier from Fort Drum may not have been from the field of battle; the lucky Army man just won a huge lottery jackpot. Jesse Vandehorst was tired of $30 tickets and he hasn’t won lately, so he decided to buy a $25 New York Lottery Wild Bonanza Multiplier instant ticket instead. He remembered that the first time he played that game he won $50. That decision made him a millionaire many times over. When he scratched off the ticket, he discovered he had won the top prize of $5 million! He immediately headed back home and showed the ticket to his wife. Her response was to ask him where he got the fake ticket! This early he has already decided to take a single cash payment of $3,309,000 after taxes, in lieu of the full amount in yearly amortizations. He says he will use his winnings to save for his three daughters and to take the family on a vacation somewhere, maybe Disneyland.